True satisfaction, when it comes to fly fishing gear, is finding a rod or reel that you love so much, you truly don’t give a damn about what it might possibly fetch someday on eBay. 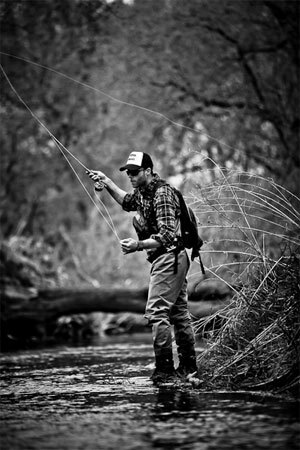 Even better, while many of us might rationalize buying that rod, reel, net or whatever to our significant others by saying it’s a potential “heirloom,” the fact is that the most valued hand-me-downs have nothing to do with market worth, and everything to do with how much they were treasured on the water by the person who owned them in the first place. I fish rods, and I carry things in my fishing vest that aren’t worth a plug nickel, but they’re special because they came from people who mattered a lot to me. My favorite rods and reels, however, are the ones that have worked best in helping me catch memorable fish. The price I paid has nothing to do with any of that. When I go on trips to write stories, I carry a “lucky” waterproof ballpoint pen that folds in half, partly because I realize the utility of a waterproof pen when I’m scribbling notes in rainstorms on the water, but mostly because it was given to me by Charlie Meyers. I think it cost him $3.99. Today, I wouldn’t sell it for ten grand. As we enter the fishing trade show season when generation “next” reels, rods, and so forth will be press released, YouTubed, Facebooked, and blogged to the point of nausea (and I will admittedly be wrapped up in the hype machine, writing stories about all of that). I’m simply hoping that the dedicated angler can see clearly enough to realize that true love is born of fishing utility. What’s right for me may not be right for you, and vice versa. When you boil it all down, it’s all subjective, and the love affair really doesn’t count until after years on the water. It also has nothing to do with price. It has everything to do with feel. And the reason this conversation is happening in a “Fly Fishing Jazz” context is because that’s exactly how and why icons of the music world have turned odd, misshapen, strange musical instruments into artifacts. I’ve touched on this notion before. When you find that rod that you really like, don’t be afraid to take out the sandpaper and scratch down the thumb spot in the grip until it fits just so. Just for you. Just for now. It won’t be worth as much as a “mint condition” equivalent that’s never been out of its tube. And your great-great-grandson’s thumb might not fit the groove you made. So what? I guarantee he’ll appreciate that groove for what it really represents. And in the end, that’s all that really matters.